Bono and Edge are guests for the first episode in the second series tonight which 'allows some of the most interesting and influential artists and personalities a rare opportunity to reflect on their work and jam with Elvis'. Sounds good... particularly as we hear that Bono and Edge get to join Elvis and The Imposters to perform 'Alison' and 'Pump It Up'. Post a comment below if you catch the show. Every time I watch U2, whether live or on TV, performing or in interview, I have a big smile on my face. It's elusive to me to understand exactly why this is. Obviously great music, but also a humility that is reassuring and a sense of them being fun people to hang out with over a pint. Genuine might be the word I seek. Maybe someday I'll get the chance, but for now, I just keep buying concert tickets (360 tour 4 times, am I pathetic?) and hoping that I'll run into them in a local bar after the show where we can chit chat like they did with Elvis and bask in the afterglow of a great show and extend that smile on my face for a couple hours longer. Also a big Frank fan and love the song Bono, wish you two could have sung it together while he was still with us. Loved the show they were both so humble and awesome at the same time! They are better than ever.... see you in Montreal this summer! The show was like having your cake and ice cream too. Course I like my cake and ice cream separate to fully appreciate the wonderment of each. I watched it. What a great show. Great performances by all. Love the Song 2 Shots of Happy, 1 Shot of Sad. Can't wait till July 3 in Toronto!!! This was a great show with humerous stories. It was worth watching and Stay (faraway, so close)was a very beautiful outstanding performance. hehe, now elvis is wearing the funny cowboy hat! The U2 backstory never grows old - from uncertain beginnings to enduring greatness, all the while infused with humility and humor. The spark of the divine continues to shine on and through U2. Four shots of happy. Great interview and music--amazing collaboration. Loved seeing/hearing Elvis and the boys put new spins on U2 songs. The passion, the passion... The respect each artist gave the other was so evident. Bravo! "Two Shots of Happy, one Shot of Sad", a song written for Sinatra. I think Sinatra never did this one because he didn't think he could pull it off like Bono. Pure speculation, and just my thoughts personally. It was great to hear and see something different and new!! Thanks Elvis, bono and the Edge!! I caught the show on demand and it was really great show and it's always fun to see the band in an interview situation, they're always entertaining. I particularly enjoyed Bono singing "Two Shots of Happy, One Shot of Sad"...fantastic! I was just getting ready for bed when my parents called into the bathroom "Bono and The Edge are on TV!" I jumped up, still with toothpast in my mouth, and watched the show. It sounded very much like a classic U2 interview. 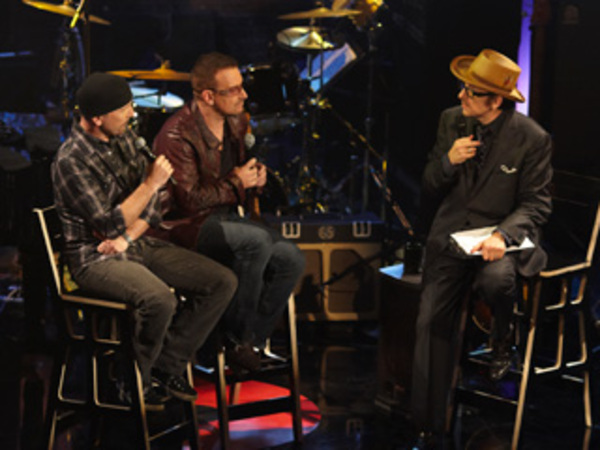 Talking about writing songs, Edge and Bono expressed their funny way of writing them, the disorginization of it all. Sounded like Bono in Conversation. But my main complaint with the show is about the songs. Elvis totally ruined 'Stuck in a Moment' with his vocals, and 'Stay' was only performed accoustically. I liked the album's version better. The only song that was really quite good was "One shot of Happy'. But then they totally blew the credits with the blend of 'Pump it Up' and "Get on Your Boots'. Sorry, but the show just wasn't all that good. Couldn't catch a view live but just viewed a clip or two on the web of the chat... Yummy Irish/Welsh draw... YES U2 is a universal party fav for all occasions : ). and it was worth checking out. Enjoyed the "covers" by Elvis Costello's band. Really liked the acoustic number and Bono's tribute to Sinatra. Thanks for a great show in Vancouver from your San Diego fans. Stay, Two Shots of Happy!!! Great show, with a great host, and guests. Thanks for playing 2 of my all time favorites, and rarities, "Stay" and "Two Shots of Happy, one Shot of Sad", along with some other nice surprises.